The number of people who currently speak Euskara – counting those within the Basque Country as well as in the rest of the world – comes to almost 700,000. Gipuzkoa is the most Basque-speaking territory. 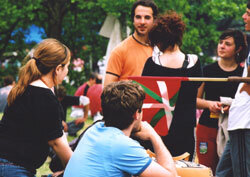 In the Basque Autonomous Community and also in the North Basque Country (as the Basque Country within the French Republic is called), the proportion of Basque speakers is one in four while in Navarre it is one in ten. The process of linguistic normalisation initiated 20 years ago in the Basque Autonomous Community has borne fruit: six out of ten young people know the Basque language. In the North Basque Country, however, the process is going the opposite way: only one in ten young people speak Euskara, which places our language in this territory amongst the 3,000 which, according to UNESCO, is in danger of disappearing. 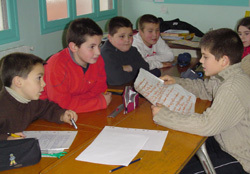 Despite the odds, the teaching of Basque continues to advance: apart from the great success of the public sector and private sector ikastolas where the Basque language is the teaching medium for all subjects, there are non-total immersion methods at other public sector schools and in Roman Catholic grant-aided. A great number of degree courses can also be taken in Euskara in all the territories. Throughout the Basque Country, a number of public and private bodies encourage the literacy of adults in the language: 50,000 people are currently learning our language in this manner. Euskara has become a language of communication. Likewise, the language has been able to take great advantage of new ICT s (multimedia groups, Internet, and so on). Apart from all this, the official recognition of the Basque language has boosted it in areas such as education, public administration, road signs, etc, in a good part of the Basque Country. There are also numerous initiatives under way for literacy in society and for the encouragement of the use of Euskara. In the North Basque Country, the use of Basque in public life is more than it was some years ago but there is still a long way to go as regards transmission between generations, teaching and many other spheres.